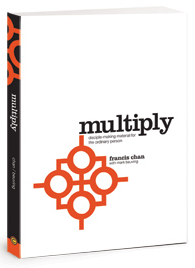 Here is excellent material from Francis Chan and David Platt to help disciplers guide new or younger believers into the essentials of the faith, how to live as disciple makers and as the church, how to study the Bible, and understanding the Old and New Testaments. Each of the 24 chapters in this eBook (see below) has an accompanying workbook section and lesson video/audio. It’s all FREE! Take advantage of this material and start discipling someone younger in the faith. Click the link on the right that says “Click to Access Material.” You’ll then get redirected to Chan’s website where you can download the free PDF of his book or watch the videos corresponding to each chapter. If you’re looking to download the book, click the link that says “Click to Access Material.” You’ll be redirected to the Multiply website and from there towards the very top of the page click the “Download PDF” link to get the whole book. If you’re looking for session materials, scroll down on that page and click a session’s title to reveal download links for that session. You can click the picture to the right of the download links to watch the video corresponding to that session. If you need further help, please feel free to ask. Praying that these resources will be very helpful for you! I still am unable to download the PDF. I have looked everywhere. I can find the material and how to download the Spanish version. Any help will be appreciated. Love in Christ, Keith. I can get the pdf download on the book, I can’t find the study guide or workbook. To access the study guides/workbook, click each session’s title and then click “Download PDF” underneath. I want the Spanish version please. The link is not working. Thank you for the heads up. The website is back up, and the resources are available again! Enjoy! Are the videos available in Spanish or with Spanish subtitles? Unfortunately, these FREE videos are only available in the English version.